Good morning! Today at Dream Valley Challenges we are sponsored by Meljen's Designs! They have given us (the DT) some awesome images to play with! I have chosen to use String of Hearts for my Valentine's Day Card. Oh yeah, did I tell you? The challenge is Valentine's Day! LOL I'll get all the info in one of these times! I printed this digi large and colored it in with purple Copics. I found the purple heart gems in my bling box and added some sheer ribbon to the ribbon on the digi. It's hard to see it, but the dark purple background is dry embossed. There's also glitter on the swirls and around the hearts, and crystal effects on the middle heart. This is such a beautiful Valentine's card, Kendra! 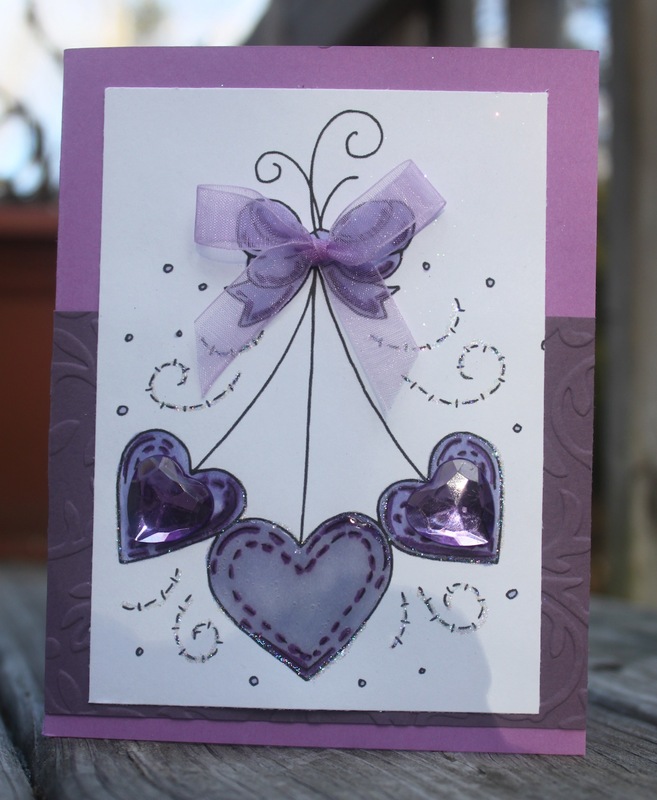 I love your choice of purple colors, and the image is great - what a fabulous idea to put an actual bow over the bow of the image, and those bling hearts are such perfect embellishments for this card! So cute valentine's card. I love combo.